The town of Kolbermoor is adding a mixed residential and commercial building to the site where the new town hall is located in order to provide affordable housing in the town’s center. Seventeen subsidized residential units of various sizes spread over four floors are planned, while a ground-level restaurant offers the Rathausplatz square a new public space. 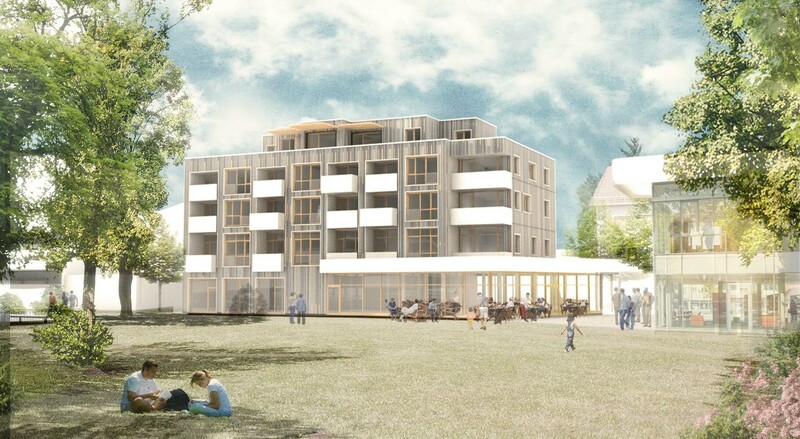 The new building will play a special role within the context of Kolbermoor’s urban fabric, harmonizing with the ensemble made up of town hall, library, adult education center, and parking garage, while complementing the street walls facing Rathausplatz and Rosenheimer Straße to the north. The slightly oblique course of the structure’s eastern facade allows the square’s buildings a view of the park to the south. The ground-level area sheltered by the overhanging roof makes a significant contribution to the building’s function as a connecting hub. A new bus stop offering protection from the elements has been integrated into the northern side of the building facing Rosenheimer Straße, while the restaurant to the south will help enliven Rathausplatz. The large terrace running around the entire building is extended to the south into the beautiful park with old trees—a space that invites visitors to linger. The transparent façade, which extends all the way to the ground, allows the restaurant, square, and park to fuse with one another. The façades and internal organization of the building respond differently to the different directions. Facing Rosenheimer Straße to the north, a geometrically distinct façade and appropriate windows are built into the design where bathrooms, bedrooms, and stairwells are located. The living rooms, however, face toward the park in the south, and here the façade differs from the northern aspect in its inclusion of uniform openings differentiated by means of projections and recesses as well as large, protected recessed balconies and outdoor spaces. The façade is covered with a fine grid and lines, which promotes the building’s modest yet elegant appearance from all sides. Its sound-absorbing characteristics protect residents from the noise of the lively Rosenheimer Straße to the north, west, and east while also having a positive acoustic effect on the local surroundings. A municipal housing plan provides the basis for the variety of apartment sizes. The apartments on the second to the fourth floors are all arranged so that the kitchens, living and dining areas as well as the loggias face the south and enjoy a view of the park and mountains. The open-plan kitchens are connected to the living areas, thus helping to create a large and continuous living space stretching from the entrance area to the loggias with glazing reaching all the way to the ceilings. The two top-floor apartments also enjoy southern-facing roof terraces accessible from the living areas. In order to facilitate flexible usage for all floors, the ferroconcrete floors rest upon pillars of the same material within the internal partitioning walls, which are bricked in to offer a sufficient degree of support. All of the non-supporting walls that were not constructed using reinforced concrete were planned as brickwork. The interior walls are all of lightweight construction. 2.630 qm / 28,310 sq.ft. 8.413 cbm / 297,105 cu.ft.